A man down on earth needs our help. Splendid! Is he sick? No. Worse. He’s discouraged. 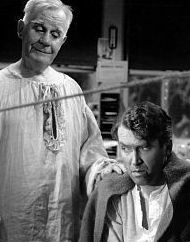 Even if you’re not familiar with “It’s a Wonderful Life” that short dialogue is so evocative. It speaks to something deeply relevant in our lives – the need for others to lift us up when we need it the most, even if we don’t recognise that need ourself. Generosity meets humility. The gift of friendship. Love. Encouragement. We all struggle and it’s those around us who make the difference. It’s the message throughout “It’s a Wonderful Life” and each year as we watch the film again for me the message comes over stronger and stronger. It reminds me to look out for that discouraged friend. It reminds me when I feel despair that I have friends who always help. Perhaps something for us all to reflect on as we start to stop and get ready to spend time with our loved ones over the Christmas holidays. Be well. Love. Help others. Encourage. « #SharingReading – What’s been your article of the week?